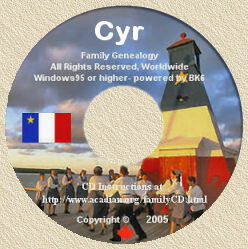 Acadian Genealogy Homepage; Sketches of an Acadian Journey, resulting in "The Royal Proclamation". I am very grateful to my good friend, Warren A. Perrin, for having provided me authorization to reproduce Chapter 12 of his excellent "Acadian Redemption" Book, describing his effort to obtain an "apology" from the British Crown for the atrocities committed during the 'Grand Dérangement' in 1755, when the British used military force to displace some 15,000 Acadians from their homeland. Chapter 10, Pages 101 to 104. "I have received from his Excellency Governor Lawrence, the King's Commission which I have in my hand and by whose orders you are convened together to manifest to you his Majesty's final resolution to the French inhabitants of this his Province of Nova Scotia who for almost half a century have had more indulgence granted them, than any of his subjects in any part of his Dominions... That your lands and tenements, cattle of all kinds and livestock of all sorts are forfeited to the Crown with all other your effects saving your money and household goods and you yourselves to be removed from this his province." Simply because the Acadian delegates refused to sign another oath of allegiance that would have stripped them of their rights, the British Crown made the decision to deport them and to confiscate their belongings. The Acadians had done no wrong. With the possible exception of a few men following the French Abbé Le Loutre, they had not given any sign of insurrection. All they had done was continue to speak French, practice Catholism and turn lands no one else wanted into the envy of the British Empire. I spite of any criticism one may have about the present-day Petition for an apology - all those involved are long dead, another example of political correctness run amok, what difference does it make, etc. - there are a few incontrovertible facts that make it necessary: on July 28, 1755 France and England were at peace. Furthermore, the Acadians, by virtue of the Treaty of Utrecht of 1713, were British, not French, subjects. They had already pledge allegiance to the British Crown with certain stipulations, such as not being required to take up arms against the French. Under the rule of law, these are paramount distinctions. The Grand Dérangement set into motion a series of events that have repercussions to this day. There are economists who opine that Nova Scotia's economy was devasted for generations after the expulsion of the farmers who knew how to work the land, and indeed the ill effects are still felt today, if to a lesser degree. Now know you that we, by and with the advice of Our Privy Council for Canada, do by this Our Proclamation, effective on September 5, 2004 designate July 28 of every year as A Day of Commemoration of the Great Upheaval commencing on July 28, 2005." "The exile begins never to end... Warren Perrin is haunted by this line from Longfellow's poem Evangeline. It conveys the tragedy of the Acadian people, banished from their ancestral lands by a violent and cruel governor bent on genocide. It describes an injustice that has never been acknowledged, a crime never punished, a wrong never righted. Perrin, an Acadian by origin (90% Broussard on his paternal and maternal sides) and an attorney by profession, is seeking to close the book on this gross violation of basic human rights. He has drafted a lawsuit that sets out the grievances of the Acadian people and asks for compensation from the government of Great Britain, in whose name the deed was carried out 235 years ago. Perrin does not seek monetary damages, either for the lands that were seized from his ancestors in Acadie nor for the suffering they endured during their odyssey from Nova Scotia to South Louisiana. Rather he wants the English to admit that 'Le Grand Dérangement ('the clearest case of genocide you can find') was carried out in violation of English and international law of the time. And he wants the British government to erect a monument ---une symbole physique--- which would represent the end of the exile. Warren Perrin said he is on a mission to help right a grievous wrong--- the genocide and scattering of an oppressed minority group in Eastern Canada more than 200 years ago. An attorney, founder of an Acadian Museum here (in Erath, LA), and president of the Council for the Development of French in Louisiana, Perrin said he is seeking a formal apology from the British government for the expulsion of Acadians from Nova Scotia in the mid-eighteenth century. Perrin also said the deportation order, which exiled French Acadian settlers from their homes and separated families and forced many to undertake risky sea voyages to start new lives in Louisiana and elsewhere, never annulled. Understatement: Warren Perrin is extremely delighted. At 2 p.m. Wednesday, December 9, 2003 Governor Adrienne Clarkson, the Canadian head of state and the Queen of England's representative in Canada, signed a royal proclamation (se below) that not only acknowledged the expulsion of some 15,000 Acadians from Canada but recognized the wrongs it caused. The proclamation -signed in Ottawa- also designated July 28 as an official day to commemorate the Acadians and the expulsion. Perrin started the movement for recognition and apology in 1990 by sending a letter to Queen Elizabeth ll and her current prime minister. Perrin, who even declined offers of money for endowed scholarships to quiet his actions, credits the non-confrontational and non-financial nature of the request for its success. Whether or not talk of the queen reading the proclamation at Grand Pré, National Historic Site in Nova Scotia, during a royal visit slotted for 2005 is true [it didn't happen] doesn't seem to matter to Perrin. We are never going to forget it, but it's closure. The queen is finally saying what happened to you was wrong and it was in my name. She doesn't say I am terribly sorry, but there are many other ways to apologize. Therefore, instead of a proposed monument acknowledging the responsibility of the British Crown in the events of 1755 as had originally been requested, there is now a national holiday. Instead of the many, but limited, number of visitors to a commemorative site learning about this tragedy, now tens of millions of people will learn about it, thus adding to the hopes of all people that such a thing never happens again. A (bilingual) reproduction of the following "Official Royal Proclamation" is available from the Acadian Museum/Proclamation Order, 203 South Broadway, Erath, Louisiana, 70533 Telephone (337) 937-5468 or (337) 233-5832 for the minimal cost of $5.00. Now know you that we, by and with the advice of Our Privy Council for Canada, do by this Our Proclamation, effective on September 5th, 2004 designate July 28 of every year as "A Day of Commemoration of the Great Upheaval", commencing on July 28, 2005. In testimony whereas, We have caused this Our Proclamation to be published and the Great Seal of Canada to be hereunto affixed. Our Right Trusty and Well-beloved Adrienne Clarkson, Chancellor and Principal Companion of Our Order of Canada, Chancellor and Commander of Our Order of Military Merit, Chancellor and Commander of Our Order of Merit of the Police Forces, Governor General and Commander-in-Chief Canada. At Our Government House, in Our City of Ottawa, this ninth day of December in the year of Our Lord two thousand and three and in the fifty-second year of Our Reign. On behalf of all Acadian People now 'dispersed' throughout the world, I offer sincere thanks to my Acadian friend, Warren A, Perrin. Click here to view more on the Royal Proclamation.